You might be asking yourself, “What do spider mites look like?” Don’t worry if you’re at a loss because you cannot easily see them with the naked eye. You will need a magnifying glass to be able to see these little pests. Mature spider mites have eight legs, are typically red or black, and live on the underside of the leaves of plants. 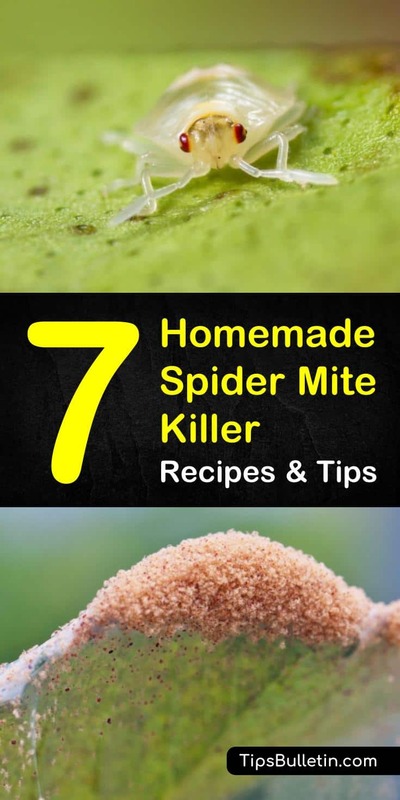 With this article filled with homemade spider mite killer tips and recipes, you’ll learn natural ways to get rid of these garden pests. How do you know you might have a spider mite infestation? The vital signs to look for include small holes or punctures along the plant leaves, brown spots on the leaves, or fine webbing on the underside of leaves. If you see any of these signs, chances are you have infested plants and, therefore, a spider mite infestation. In this article, you can learn about ways to make a natural spider mite killer and not to have to worry about chemical pesticides. Regardless of which methods work best for you, your family, and your garden, you will learn how to get rid of spider mites. At the beginning of the growing season, and maybe as often as every other week, use your garden hose as the first line of defense against spider mites. These insects tend to congregate in dusty plants or plants that are running low on water. Grab your garden hose and spray your plants every so often to keep them healthy and clean. This extra step is especially crucial for your houseplants. You don’t want any spider mites to come inside and become houseplant pests, so take your houseplants outside periodically and hose them down as well. There is a particular family of mites, the Phytoseiidae family, that are known to prey on spider mites. Specifically, you are looking for the Phytoseiulius persimilis, which we know about thanks to research done by the University of California. An individual predatory mite can eat up to five spider mites a day, helping to drastically reduce the reproductive potential of your infestation. These natural predators will eat many different kinds of mite species and, even better, they won’t damage your garden, making these beneficial insects an excellent biological control method and integrated pest management (..). However, you only want to use this on your outdoor plants. Organic neem oil, one of the most pungent and useful pest control methods, is also one of the natural ways to save your infested leaves from further mite damage. Follow this recipe for a helpful DIY spray for spider mites. Add the ingredients into a spray bottle and shake the bottle to mix. Use the oil spray on the entire plant. As the spider mites eat the section of plant coated with the homemade spray, they will die. Repeat this process for your entire plant every couple of days until you begin to notice that the fine webbing is gone, meaning that the spider mites have been eliminated. Another easy DIY spray for spider mites is an alcohol spray you can make with things around the house. Follow the proportions and instructions below for an effective homemade spider mite killer. Mix the ingredients in a spray bottle. Spray the mixture onto the leaves of the plant, particularly the underside of leaves. The alcohol will kill the spider mites on contact. You will not want to use this if you have tried predatory mites, as the alcohol will kill them, too. Insecticidal soap is an easy solution to kill spider mites. However, it is essential to know that insecticidal soap can also kill predatory mites, so if you have tried that pest control solution, then this will not be the choice for you. You can make this insecticidal soap with ingredients found around the house. Pour the ingredients into a clean spray bottle and shake to mix. You want to spray the dish soap water mixture over the entire plant, including the stems and the underside of the leaves. The composition of the dish soap will help dissolve the mites’ exoskeleton and make them more susceptible to dehydration and a quick death. Be sure to test the water spray on a smaller section of the plant before continuing to the entire plant to make sure that the plant won’t have any adverse reactions. If you want to pack an extra punch to your insecticide which will help deter future infestations from most garden pests, add two tablespoons of hot pepper powder to the solution. The capsaicin from the peppers works to prevent plenty of pests. Cayenne pepper and jalapeno pepper work best. If you want to harness the natural way that essential oils can be beneficial, use rosemary oil. Rosemary is a natural insecticide and using a concoction of rosemary oil and water will take care of your spider mite infestation. With a 2:1 ratio of water to rosemary oil, spray the oil spray onto the leaves of the plant to serve as a natural spider mite killer. This oil spray is the best spray for spider mites if you have already used predatory mites because the rosemary oil will not kill them. If you have a garden full of fruit trees, then you might want to use horticultural oil. With fruit trees, you have to be extra careful because people will probably be eating the fruit. By choosing a horticultural oil spray (especially a vegetable-based oil spray), you are keeping chemicals typically associated with pesticides away from your family. When you apply the horticultural oil spray at the beginning of the growing season, the eggs that have lasted over-winter will become dehydrated, die, and fall off. This treatment will help your fruit trees start the season off mite free. You can also continue to use a horticultural oil spray throughout the season against spider mites. The oil spray will coat the insects and suffocate them. Because the life cycle of the spider mite is so short (roughly 20 days), they have a very rapid reproduction rate with females laying as many as 20 eggs a day. Hopefully, you found these various home remedies helpful in pest control endeavors. 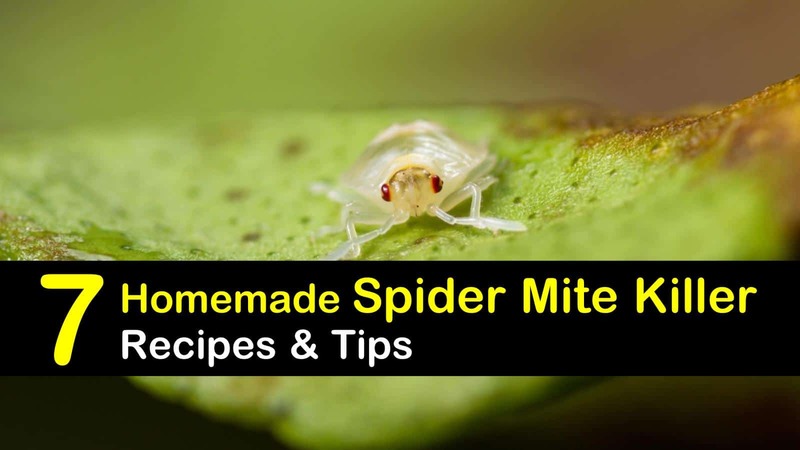 If you have any friends or family who could benefit from this article of homemade spider mite killer tricks, please share on Facebook or Pinterest. Everybody deserves to have a beautiful, pest-free garden to call their own.